You’ll get to brew with some of the best brewers in the world over four quintessential New England days from June 9-12, 2019. Vinnie Cilurzo, Founder/Brewmaster, Russian River Brewing Co.
Jason Perkins, Brewmaster, Allagash Brewing Co.
Neil Fisher, Founder/Brewmaster, WeldWerks Brewing Co.
Sam Richardson, Cofounder/Brewmaster, Other Half Brewing Co.
JC Tetreault, Founder/Brewmaster, Trillium Brewing Co.
Henry Nguyen, Owner/Brewer, Monkish Brewing Co.
At this exclusive retreat, you'll brew with some of the country's top brewers, connect with brewery owners from around the country, enjoy a beautiful pairing dinner with limited-release beers, and relax at a quintessential New England resort, Spruce Point Inn. All accommodations, lunches, dinners and select beers are included, but space is limited, so book today! 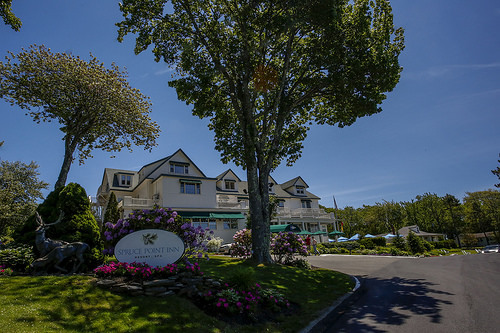 The ticket price includes three nights of luxury lodging at the Spruce Point Inn, lunches, dinners, round-trip transportation from Portland and Boston (at specific times only), craft beer at evening events, all the brewing supplies you'll need, and all taxes and gratuities. Each of the attendees will also get an awesome goodie bag with a retail value of more than $200. Craft Beer & Brewing will ferment and bottle the beers to send you a handful of bottles to enjoy. You’ll have the ultimate collaboration beers to share with your friends. Contact Haydn Strauss (hstrauss@beerandbrewing.com) if you’d like to be added to the waitlist. Vinnie Cilurzo is co-owner with his wife Natalie of Russian River Brewing Company in Santa Rosa and Windsor, California. Aside from their downtown Santa Rosa brewpub, they recently finished construction on their new production brewery and restaurant in Windsor, CA. In 2008 Vinnie was honored with the Brewers Association Russell Schehrer Award for Innovation in Brewing and in 2017 Vinnie and Natalie were honored with the Brewers Association Recognition Award. Jason Perkins is the Brewmaster of Allagash Brewing in Portland, Maine. He was one of the first employees in the company and he has been there for the past 18 years. 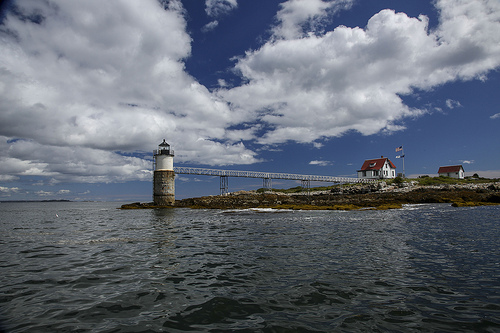 Prior to that, Jason enjoyed opportunities to work at The Kettle House in Missoula Montana and Gritty McDuff's in Freeport Maine. He began his brewing career like so many craft brewers as a homebrewer during college and the early years thereafter. He is also a graduate of Bates College in Lewiston, Maine. Perennial's Brewmaster and Co-Founder is Phil Wymore, formerly of Goose Island and Half Acre Beer Company in Chicago. Phil was hired as a brewer for Goose Island in 2006 and was eventually promoted to Cellar Manager where he oversaw the barrel-aging program and all fermentation processes. Phil left Goose Island in 2009 to become the Head Brewer at Half Acre Beer Company. While in Chicago, Phil studied brewing at the world-renowned Siebel Institute. Phil returned to Missouri with his family in 2010 to build Perennial Artisan Ales. Sam Richardson grew up in Portland, Oregon, and came to New York by way of Oregon State University’s Fermentation Science program, The RAM Restaurant and Brewery in Seattle, and Pyramid Brewery in Portland. Richardson moved from the Northwest to Brooklyn to work at Greenpoint Beer Works, where he would meet Matt Monahan (Other Half Cofounder). Their vision was to build a passionate team that brewed great beers in the state of New York—done so with effort and thoughtfulness—to represent the “Other Half” of the industry. Since opening Other Half in 2014, Richardson has pushed the boundaries of brewing through constant innovation and collaboration with peers (collaborating across the country from Trillium to Monkish). Sam is known in the industry for his constant passion for learning and sharing knowledge, making the Brewers Retreat a perfect event for his inclusion. Other Half Brewing currently holds a ‘Top 50 Brewery in the World’ honor on Untappd with the second most checkins, speaking to their consistent production of high quality beers across every style they brew. With a background in science and a passion for cooking and flavor combinations, brewing beer seemed to be an inevitable destiny for JC. A native New Englander, JC has always been drawn to the produce of the season, and is dedicated to using local crops and flavors in Trillium’s beer. He is notoriously meticulous in his craft with an innate curiosity for exploring new flavors, something that has made Trillium stand apart in the ever-growing craft beer industry. In 2013 Trillium opened doors to their first brewery in Fort Point. Since then, JC and his team have become leaders in New England craft brewing. 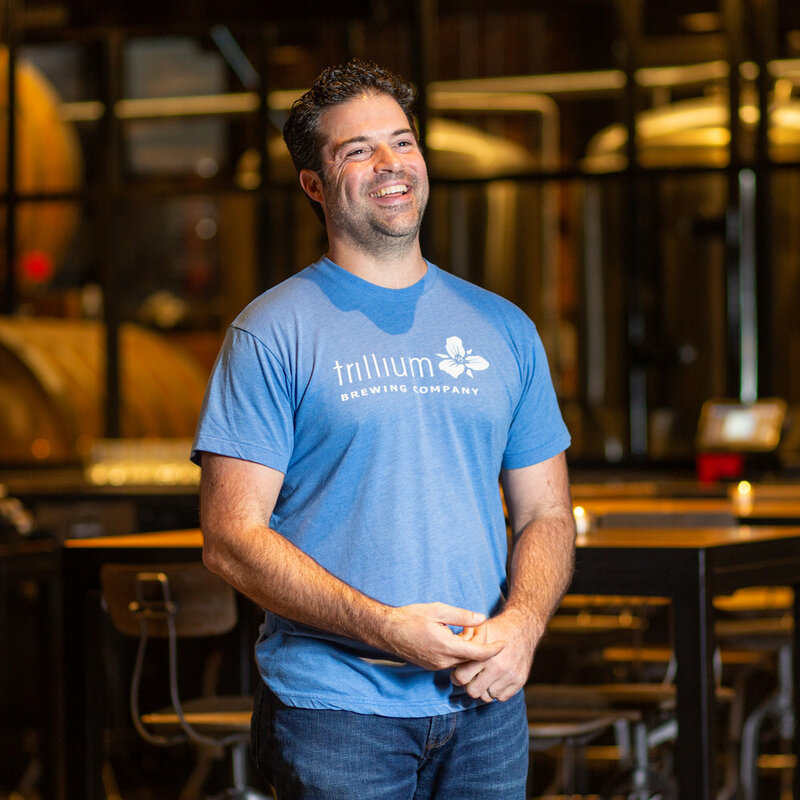 Following the success of the first Fort Point location, Trillium debuted locations in Canton, the Greenway, and a new flagship restaurant and brewery in Fort Point. JC is proud to attribute Trillium’s success to the family culture he and Esther instilled, and the use of creative ingredients. A self-proclaimed “botany nerd”, the Trillium flower represents what he and Esther hoped to create in their beers: beauty, strength, simplicity, and balance. Lawson’s Finest has earned critical acclaim and an enthusiastic fan following. Sean started the 1bbl nano-brewery with his wife Karen in 2008 after 20 years of home brewing. His specialty maple beers & IPA’s have garnered awards at the World Beer Cup, Great American Beer Festival, and at two National IPA championships (2011 – Triple Play IPA and 2016- Super Session #2). Lawson’s Finest grew to a 7bbl system in 2011 in a small sugarhouse style shed next to their home. In 2018 Sean and Karen opened the Waitsfield brewery, taproom and retail store. Sean is a graduate of the University of Vermont, with a Bachelors in Environmental Science and Masters in Forestry. His first career was as a scientist and educator. Sean continues to lead outings with the Naturalist Program he founded in 1996 at Mad River Glen ski area. Sean served as President of Vermont Brewers Association from 2014-2017 and was an active Board member for nine years. After pursuing a PhD in Early Christianity and homebrewing mostly Belgian-style beers, Henry and his wife, Adriana, started Monkish in Los Angeles, where they were born and raised. The brewery initially focused solely on Belgian-style and mixed-fermentation beers — and the occasional spontaneous fermented beers, which are a challenge given the Southern Californian warm climate. As a yeast-driven brewery, Henry has expanded the brewery’s scope to include hoppy beers (i.e. IPAs) that are more focused on yeast character than simply hops. And with their affinity for monastic brewing traditions, Henry and Adriana embrace the spiritual and metaphysical dimensions of brewing, and their brewery remains nimble and intentional in creating meaning through beer. We are still confirming some additional activities/classes. Stay tuned. At Ss Brewtech, we are all about innovation, usable features, quality, affordable prices, and top-notch customer service. We have only just begun to fundamentally change the landscape of brewing equipment for the better. We launched our business in 2013 with the Brew Bucket-—the world’s first conical-bottomed stackable stainless steel fermenting bucket. We followed this up with a solid line-up of conical fermentors ranging from 7 gallons to the ever-popular half barrel. Then came the world’s first homebrewing kettles with a built-in trub dam. And then the world’s first fully integrated homebrewing temperature control add-on system with immersion chiller coils, digital controller, and custom-tailored neoprene insulating jackets. Then we launched the world’s first all stainless infusion mash tun with a pro-style 5° sloped floor, center drain, silicone gasket seal for the false bottom, and digital thermometer. As we look toward 2016 and beyond, we plan take our business beyond home-scale gear to nano and commercial-size systems. Established in 1996, and located at 8500 feet in the Pikes Peak region of the Colorado Rockies, The Brewing Science Institute provides the highest quality yeast cultures, laboratory services, and products for the professional brewer. Business partners David Bryant and Bryan Pearson share over 30 years of combined experience in microbiology and brewing technology. We have been brewers and understand the daily challenges that arise in a brewery. Our goal is to provide knowledge on the fundamentals of fermentation, microbiology and brewing technology. Craft Beer & Brewing is committed to providing exceptional content to the craft-beer community. From cooking with beer recipes, beer reviews, brewery features, and brewing how-to, we are the quality resource for the craft-beer community. Ruby Street Brewing, LLC specializes in building top quality all grain beer brewing systems and equipment. Ultimate home brewery, pilot brewery, or nano brewery, we have brewing equipment to meet your needs. Short lead times, innovative products, and outstanding customer service make Ruby Street Brewing your best option for professional grade equipment. Made in the US from strong corrugated Kraft cardboard, our beer & wine Spirited Shippers are layered with extra cushioning and include a special insert for each and every bottle for safe and secure shipping. Light weight and tough, our beer & wine shipping containers are environmentally safe, fully recyclable and made with recycled material. They ship flat, saving you money and valuable storage space. From one bottle to twelve, half size to magnum, our boxes will meet all of your wine, beer and spirit shipping needs. Can I pick the brewmaster that leads my group? Yes. Prior to the event we will send out a survey for your preferred lead brewer. If a brew group is full, preference will be given to the attendee that purchased their ticket first. That said, we’ve always accommodated every request. We expect there will be about 10 gallons of each of the beers by the end of the three days. When the beer is ready, we will bottle and ship 4-6 bottles to each of the participants. What time can we arrive at Spruce Point Inn? You can arrive in the morning to participate in the activities they offer; however, you may not be able to check into your room until later in the day. 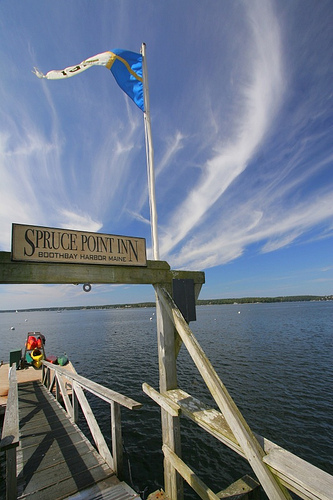 How late can we stay at Spruce Point Inn? You can stay for the day to participate in the activities they offer; however, you will need to be checked out of your room by noon if you're not staying Wednesday night. Sunday dinner, Monday lunch and dinner, and Tuesday lunch and dinner are included in the ticket price. How much beer will be provided? At each dinner we will provide the equivalent of at least one beer. Happy hours and receptions will offer unlimited pours. Why was Will Meyers removed from the event? Unfortunately Will had a private family issue matter that made it impossible for him to join us.